A masterpiece of innovative optical design, this compact, lightweight, high performance standard zoom (26-78mm equivalent) delivers a fast F/2.8 aperture over its entire focal-length range for maximum creative flexibility. To maintain critical sharpness when shooting handheld it includes VC (Vibration Compensation), Tamron's state-of-the-art, tri-axial image stabilization system. Three compound aspheric elements, special LD glass, and BBAR coatings ensure superb correction, color fidelity, and freedom from flare. 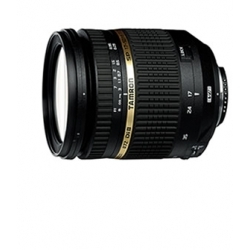 A minimum focus distance of 0.29m (11.4 inches) offers exciting close-up opportunities.